This preview chapter will allow you a peek into this guide to the iterative organization, the only kind of organization that can learn and adapt fast enough to keep up in today’s world. For anyone running a team of managers, or advising someone who does, it describes the fundamental behaviors that create iteration, explains how to implement them, and includes videos and online assessment to get the process started. 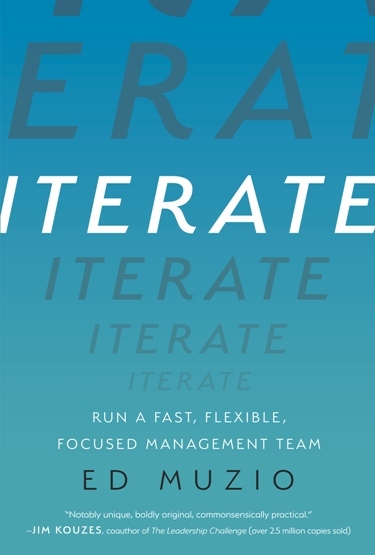 Iterate defines what management really is and helps readers create a fast, flexible, focused management team that does it well. Ed Muzio, award-winning author, CEO, and “one of the planet’s clearest thinkers on management practice,” provides a research-based blueprint for a management team that will take the next best step for the organization in any situation. This book enables senior leadership, front line and middle management, and human resource executives to equip their teams with both knowledge and practical skills so that they not only understand their own purpose but also perform that purpose well amidst ever-changing conditions. Iterate will help readers create measurable business results on any management team, of any size, in any industry where complex work and frequent change are the norm. Click below to download this preview.